My PrehKeyTec keyboard does not work as expected - is it really defective? By the following questions/answers we would like to give assistance to solve common issues with our programmable keyboards. If you cannot solve the problem this way, please send a Support Request to our technical support team. Please note: Improper handling or incorrect configuration is not covered by the keyboard limited warranty. Is there any manual for programming my keyboard? Please refer to our Quickstart WinProgrammer [PDF] in the manuals section. This document contains can be seen as a programming manual including basic examples and information to get started programming your keyboard. In the annex you can find advanced topics and important troubleshooting hints. Is there any API to integrate the keyboard and its modules into my software? We offer installer packages for Windows operating systems to support the POS standards "OPOS" and "JavaPOS". A "JavaPOS" package for Linux is available on request. You can also directly integrate our USB keyboards into your application using our API "MWXUSB.DLL". The packages are available on the Keyboard download page - section "OPOS/JavaPOS Drivers and API". The computer indicates keyboard error during start-up or booting. Check the keyboard cable and if it is properly plugged in. Re-configure the interface by holding down the matching key combinations (e.g. A01+B01) for about 5sec. during cycling power. Details on these key combinations are listed in the annex of our Quickstart WinProgrammer [PDF] - chapter "Special Keycombinations". Such devices like wedge scanners might cause voltage drop and/or timing problems. Please connect our PS2 keyboards directly to the PC's PS2 port and restart the machine. When the computer boots up, it checks up the keyboard and tries to initialize it. If the keyboard is not detected, then an error is generated. There might be more than one solution for this problem. Please contact our support team. The keyboard sends long beeps for each key - but no data. The keyboard's internal memory is corrupt. b) Improper usage of the "online programming" method (old MWX keyboards type). First reset the keyboard interface using the matching key combinations for your keyboard type / interface. Aftherwards download your configuration file into the keyboard again. The key combinations for your keyboard type can be found in the annex of our Quickstart WinProgrammer [PDF] - chapter "Special Keycombinations". For for PS/2 and USB keyboards usually hold down key positions A01+B01 while you cycle power for about 5sec. After a successful reset you will hear some beep tones. How can I program my MCI keyboard under DOS? Basically it's still possible to program your MCI keyboard in DOS environments. Copy2mwx.exe is included in the DOS-Programmer package - available on page Keyboard downloads. MWF files can be converted to binary MWX format as described in next FAQ topic. How can I convert my MWF file into the binary MWX format? The WinProgrammer's MWF source file needs to be "compiled" into a binary MWX keytable image before transferring it into the keyboard. This step is normally done automatically when downloading a MWF file with the WinProgrammer. Select "File - Save and test keytable" to save your actual MWF source and automatically compile it into MWX image format. Simply press the "Compile" button. For downloading keytable files on customer's PCs we advise to use "frozen" MWX image files. On Windows systems just put our slim C2K package on the machine instead of the complete WinProgrammer installation. Alphanumeric keyboards sometimes send letters, sometimes numbers. This behaviour is normal. 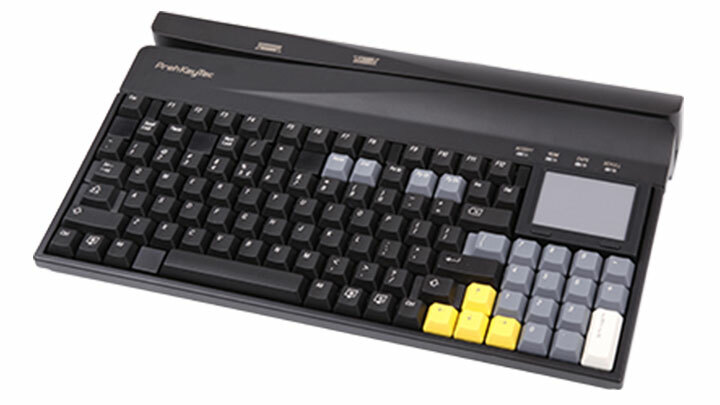 Our alphanumeric keyboards with compact layout are to a notebook keyboard. Depending on the computer's NumLock state either the codes of the letter buttons - or the codes of the numeric pad are sent for specific keys (u,i,o,p,...). Using the Fn-Ley you also can temporarily switch between both modes. If you always want to get characters, simply configure the operating system to set NumLock off. For our programmable keyboards of the MCI family you also can configure those keys to "normal" alpha keys. This is done rather easy via Drag&Drop using the WinProgrammer. The keylock (KL) does not transmit any data when If turn the key. Autoinput attribute might be "OFF" for the keylock module. Keyboard might be configured to send module data using a hidden USB channel (factory default for USB keyboards). For hardware testing, please use the key combination A01+A03+A05 - or download a sample configuration file like "test128z.mwf". Please adapt your own configuration file using the WinProgrammer and then re-program the keyboard. For details please see our Quickstart WinProgrammer [PDF] - chapter "Advanced Programming - Configuring the modules". The magnetic stripe reader (MSR) obviously does not transmit any data when I swipe a card. Please watch the Accept LED: If it gets red/green during swipe, the card data is successfully read. Autoinput attribute might be "OFF" for the MSR module. Single MSR Tracks might be switched off. For hardware testing, please use the key combination A01+A03+A05 - or download a sample configuration file like "test128z.mwf". Please also try different cards for testing - e.g. your credit card. In factory default configuration, our USB keyboards send module data (MSR, Keylock, POSKeys) on a special HID channel. In this mode called "OPOS settings" your won't see these data. You can access them inside your application using OPOS/JavaPOS or our MWXUSB API. Latest USB keyboards (firmware 605/3xxx) can of course be configured to output module data using normal keystrokes: Simply download a keytable file which has "OPOS settings" attribute switched off (WinProgrammer menu "Configuration->Expert settings"). For older USB keyboards types (firmware 605/1xxx) the output mode is fixed to OPOS settings and cannot be configured. Here you might use PS2 interface instead to get normal keystrokes. For older keyboards you might have to enable "MSR3Fix" attribute to ensure correct output for 3-Track magnetic stripe readers. The MSR3Fix option can be set in the WinProgrammer as well as in the DOS-Programmer. For details, please see 3MSR3Fix_090921.pdf. The data sent by the MSR is not being recognized properly by my application. The MSR module settings differ from those required by your software. Program your keyboard to match those requirements. Please contact your software provider for more information about the required settings. Your software might require OPOS settings. Ask your software provider if those settings are necessary. Use the WinProgrammer for adding OPOS settings to your keytable file. Such devices contain an USB chip which just emulates the PS2 connection towards keyboard and mouse. 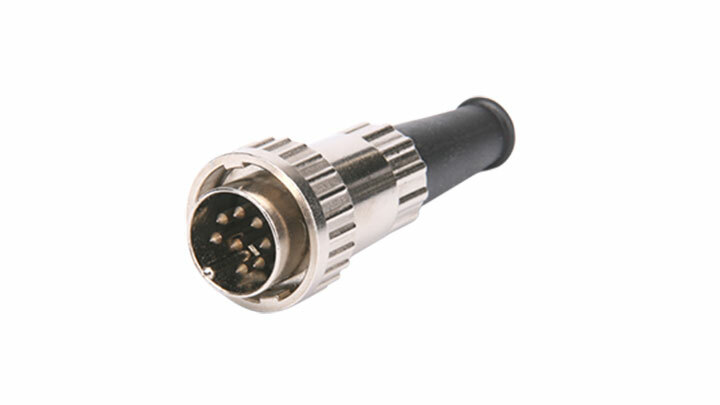 For standard keyboards such converters might work, but when receiving long/fast sequences such adapters will cause problems. For details please see usb-konverter_en.txt. Programming our keyboards behind such converters is technically not possible at all. This is only possible when connecting the keyboard directly to a hardware PS2 port. Please use a real USB keyboard (e.g. our MCI series keyboards). Our MCI series keyboards of course support programming via USB. Furthermore the MCI keyboards are backward compatible regarding keytable and do still support PS2 mode. We are sorry, the PS2 download is limited to 32bit. A PS2 driver for Windows-64bit OS is not available and not planned. The WinProgrammer itself runs on Win7 (32 and 64bit). If you need to program our keyboards directly on 64bit OS you have to use our new MCI series with USB interface. Download on USB is possible on both 32/64bit variants, as here no special drivers are required. For programming PS2 keyboards, please use C2K on a PC with 32bit Windows. You also might use our DOS tool copy2mwx.exe on a dos boot floppy (see our FAQ page how to create the mwx image).